Here is a wide view. That door leads to the living room. I had two of those huge hurricanes, but the wind blew one off, and left me with one, and a mess. Ugh. The wind really whips through our backyard. The view, however, is amazing and this pic really doesn't do it justice. I love Tennessee. Wide open, rolling hills......clean air, friendly people. Gotta love it. In the spring, summer, and fall, you can find me here. Especially during naptime, usually with some very intelligent reading, like US weekly. I have to keep up with my friends, right? Ha. I strategically shut part of the curtain so you didn't have to look at the swing set. I do it for myself too, because when I sit out here I like to pretend I am at The St. Regis in Punta de Mita. Yes, its a stretch. But I can get there. I have the memories (pre baby) and I can close my eyes and feel the breeze. Here is a little better shot of the view from the dining table. It is really peaceful. It is nice because we live in a 'subdivision,' but we have space. Brentwood is big on green space. This is the view from the sofa. The patio USED to look cute. Until we hit tornado season this month. K and I spent yesterday and LAST Monday in my closet. She watched Elmo on the Ipad. It was scary, but not as scary as last Monday. This is the part we DON'T love about Tennessee. See the dent in our outdoor heater? Ugh. The pic below sums up why the patio doesn't look good anymore right now. Double ugh. 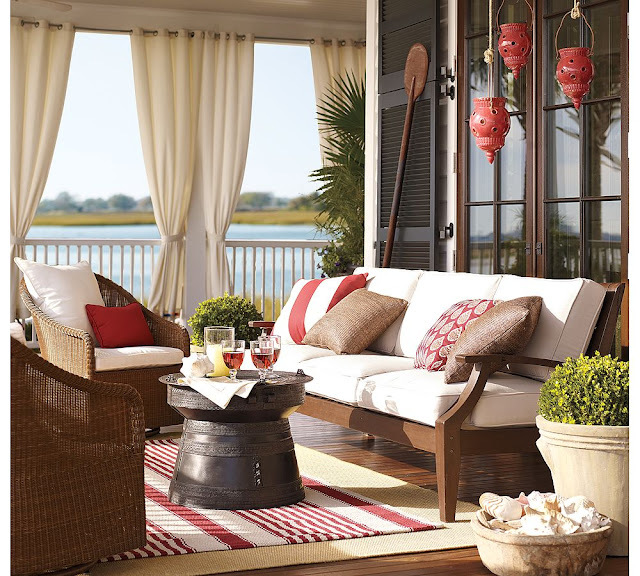 -All of the furniture and pillows are from the Chesapeake collection and Chesapeake sofa by Potterybarn. Of course, I bought mine at the outlet in Dawsonville, Georgia. The week we moved. I had it delivered right on to the moving van, ha ha. Not kidding. -The outdoor rug in the sofa area is from the Restoration Hardware outlet in Dawsonville, GA as well. I think your furniture arrangement is very close to the inspiration picture. Maybe you can add some greens of both side of the sofa to bring in some colors and soften the look a little. Perhaps, you can replace your current coffee table (two side tables pushed together? )with a slightly bigger oval or round table to create a tighter furniture grouping to create a more cohesive look. Also, you can put some white curtains behind the sofa to soften the look further. I am thinking maybe a more colorful/lighter color rug to create some contrast with the darker floors for more visual interest. Hopefully, you find my suggestions useful. Happy decorating! LOVE!!! I am so house crashing your porch with a bottle of wine on my next trip to Nashville. I am loving everything you're doing so far. I would add just more of the same. More curtains. Maybe get some colorful outdoor candles or planters. You have a great view in your backyard. Looks so relaxing.